Led by Colon, Harvey, Mets' staff on historic pace—but will it be enough? The New York Mets have been getting outstanding starting pitching, led by Bartolo Colon and Matt Harvey. But their offense may not be good enough to get them back to the postseason. CHICAGO—The good news for the Mets is that they have the greatest strike-throwing staff in baseball in 80 years. The bad news is that they might have to keep pitching at this ridiculous rate to remain a contender. New York is an unbalanced team—it is the second-best club in the National League at preventing runs but fourth-worst at scoring them. In fact, the biggest preseason question about the Mets has only been enhanced by having played one-fifth of the regular season: Do they need to trade from their pitching to find another bat? Tonight they give the ball to one of the most valued trading chips in baseball: righthander Noah Syndergaard, whose value comes from being regarded as one of the best major-league ready pitching prospects in the game. The pitching staff is carrying this club, even with a rare clunker like the one from Jacob deGrom on Monday night at Wrigley Field. For only the third time this year—the fewest in baseball—a Mets starting pitcher walked more than two batters as deGrom issued four free passes in a 4–3 loss to the Cubs. For the most part, this staff has worked wonders with little room for error, because the offense has little speed, hits too many fly balls without enough power and is 12th in the league at getting on base (.305; no Mets team in 32 years has been worse). "They’ve been great as far as throwing strikes,” New York manager Terry Collins said. “You can see by the way we play defense behind them. Nobody is ever on their heels. I mean, what infielder wouldn’t want to play behind Bartolo Colon? You don’t have to wait before the next ball is coming your way. • The Mets lead all of baseball in throwing strikes (67.6%). • The rotation has posted 4.37 strikeouts for every walk, which would break the all-time record set by the 2011 Phillies rotation (4.22). Philadelphia, behind Roy Halladay, Cole Hamels, Cliff Lee and Roy Oswalt, was the last team to win 100 games (102). Colon and Matt Harvey have combined for 78 strikeouts and six walks. • The staff is walking just 2.07 batters per nine innings. Only 10 teams in the Live-Ball Era (since 1920) walked batters so infrequently—none since the 1935 Pirates. • The Mets have held batters to the third lowest batting average on balls in play in the NL (.284), even though their infield lacks range—a credit to Teufel’s grid system and pitchers inducing weak contact. • TAYLER: Can Michael Pineda emerge as the ace the Yankees need? Can they keep this up? The trap door to their season is that Harvey, deGrom and Syndergaard have never pitched 180 innings in a season. That’s why Collins has been careful about getting extra days for his pitchers and why he budgeted Harvey for 30 starts this season, and not 33 or 34. The Mets are 5–1 so far in Harvey’s starts. The righthander wasn’t thrilled that he made his most recent start, his first loss, on six days of rest. 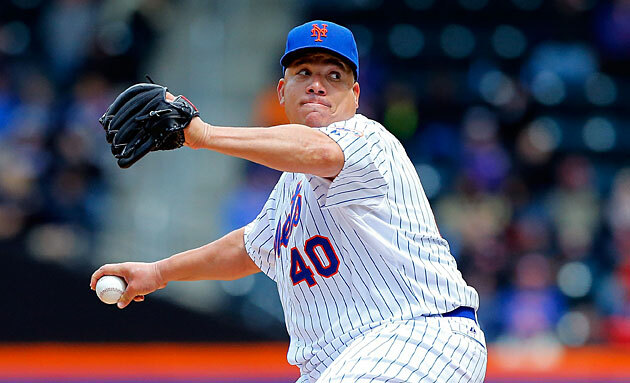 Bartolo Colon has 40 strikeouts and just one walk in his first seven starts this season. Don’t blame Collins for putting governors on his starters; buying every available day of rest is the industry standard in 2015. The workhorse ace as we knew it is becoming extinct. There have been 954 starts in the majors this year, and only two pitchers have thrown 120 pitches in a game: the Reds' Johnny Cueto (twice) and the Angels' Jered Weaver. And pitching every fifth day? Even that minimum is disappearing. It’s not just because teams such as St. Louis are considering a six-man rotation. It’s that teams are almost always using a fifth starter, so that even with an off day, the ace doesn’t stay on schedule but instead gets an extra day. Just 10 years ago, starting pitchers made 58.6% of their starts on regular rest (four days) or less. This year, “regular” rest makes for a minority of starts: just 42.8%. “Extra” rest is now the most common rest. Meanwhile, despite fewer pitches and more rest, starting pitchers are breaking down and losing their stuff faster than ever. Consider the best starting pitchers in baseball from just five years ago. Among the top 30 as ranked by ERA, 22 of them have fallen off the map in some shape or form: Josh Johnson, Clay Buchholz, Adam Wainwright, Halladay, Jaime Garcia, Oswalt, Ubaldo Jimenez, Mat Latos, Trevor Cahill, Johan Santana, Weaver, Jonathan Sanchez, Matt Cain, Brett Myers, Lee, CC Sabathia, Chris Carpenter, Tommy Hanson, Justin Verlander, Hiroki Kuroda and Tim Lincecum. That’s an attrition rate of 73% in five years. Where have all the old aces gone? They’ve been used up. Find me the veteran ace who is holding his stuff into his 30s; you can’t. This year, among the top 40 starters as ranked by ERA, only three of them are 32 or older and ever got even one Cy Young Award vote: Dan Haren, C.J. Wilson and John Lackey, none of whom ever were considered true aces. Collins is smart to protect his starters early in the season from being overworked. But the real assistance has to come from New York’s hitters. It’s unlikely the staff can continue its historic pace of throwing strikes, so the offense is going to have to perk up. Mets hitters lead the league in fly-ball percentage and are 11th in home runs—an awful combination. Second baseman Daniel Murphy, for instance, inexplicably has turned into a fly-ball hitter with modest power. How’s that working out? He is 0-for-30 this year when he hits fly balls. The Mets are not getting elite production from any position on the field, ranking seventh or worse in the league in OPS at the eight spots. The Mets are 7–9 in their past 16 games after their 13–3 start. They are four games into a stretch of playing on 20 consecutive days. There are no rest days for the starters built in, so the rotation will go four times around on regular rest. “This is one time where they can really get locked in, as far as their schedule,” Collins said. Even with injuries to starter Zack Wheeler and relievers Vic Black, Jerry Blevins, Josh Edgin and Bobby Parnell and the PED suspension of Jenrry Mejia, New York is a pitching-rich club. It just may be the best strike-throwing staff in four score. But like those 1935 Pirates, who finished fourth in an eight-team league, it might not be enough.